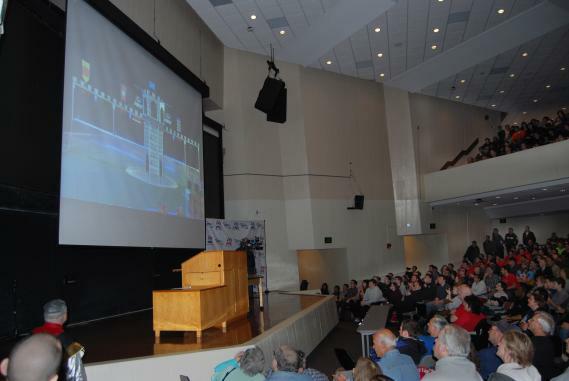 SBPLI FIRST Long Island students, educators and parents converged on the Jacob Javits Lecture Center at Stony Brook University for the 2016 FIRST Robotics Competition Kick-Off and Game Reveal. The Stony Brook University Jacob Javits Lecture Center was abuzz with anticipation on Saturday, January 9 as students, educators and families from across Long Island joined together for the unveiling of the 2016 FIRST® (For the Recognition of Science and Technology) Robotics Competition (FRC) “Stronghold” theme. Based on popular medieval castle-conquering and battle-strategy games, “Stronghold” involves two Alliances of three robots each on a quest to breach opponents’ defenses, calculate their movements and ultimately overtake their tower. Presented by School-Business Partnerships of Long Island (SBPLI), this annual event served as the official Kick-Off of the 2016 FIRST Long Island season and included a live broadcast of the game reveal direct to the Javits Center. Hundreds of eager Long Island FIRST students and their parents and coaches listened with rapt attention as FIRST Founder Dean Kamen, FIRST Executive Advisory Board Co-Chair Woodie Flowers and FIRST President Donald Bossi discussed the program as well as the 2016 theme and objective. The rules of this year’s game are simple: robots gain points by incapacitating defenses and scoring boulders through goals in the opposition’s tower. During the final twenty seconds of the game, robots may surround and scale the tower of the opposing team in an effort capture it to earn another 15 points each. Immediately following the game reveal broadcast, the visiting teams received pertinent competition details, a first-hand look at the game field, and were handed their build kits, which contain motors, batteries, a game “boulder”, an AndyMark brand parts kit, construction materials and software program login details, along with limited instructions. FIRST isn’t limited to Long Island; more than 3,100 teams from all over the world came together as a community to share in the excitement of seeing the new game unveiled and will draw on this enthusiasm during the six-week build period that is available. During this time, all FIRST students will be asked to design, build, test and update their robots before the start of the 2016 season, which includes 118 Regional and District events beginning in March. These events measure the effectiveness of each robot’s design and control, the power of teamwork and the determination of participating students not only to win, but to learn and have fun. The 2016 FRC Kick-off was sponsored by NASA and NVIDIA® and broadcasted by NBCUniversal. Please visit FRC’s Youtube Channel to watch the “Stronghold” game reveal video. For more information on SBPLI or the FIRST Long Island Robotics Competition, please visit www.sbpli.org. Those who plan to participate in the 2016 FRC are encouraged to read the full list of rules.